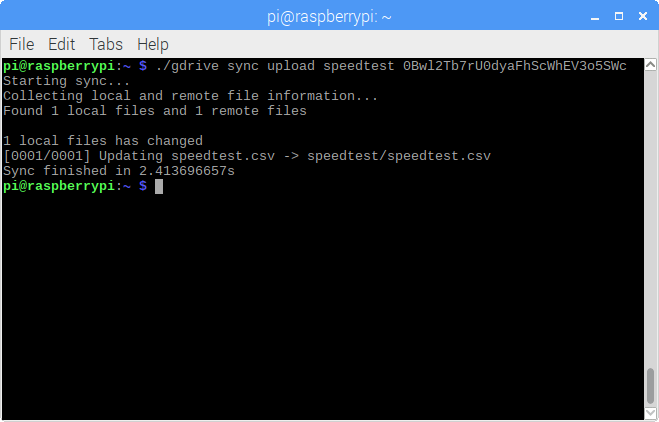 In this article, we’ll show you how to use the Raspberry Pi to monitor broadband speed. This project involves a fair bit of setup, including downloading and installing some packages, writing a Python script, and more. But once we’ve laid the groundwork, we can automate our broadband monitor so that it keeps right on monitoring for as long as we want. The monitor will create a CSV (comma-separated values) file to your Google Drive and update that file once an hour. CSV is a very simple file format that can be opened in Microsoft Excel or imported to Google Sheets. Sound like a handy thing? Then let’s get started. 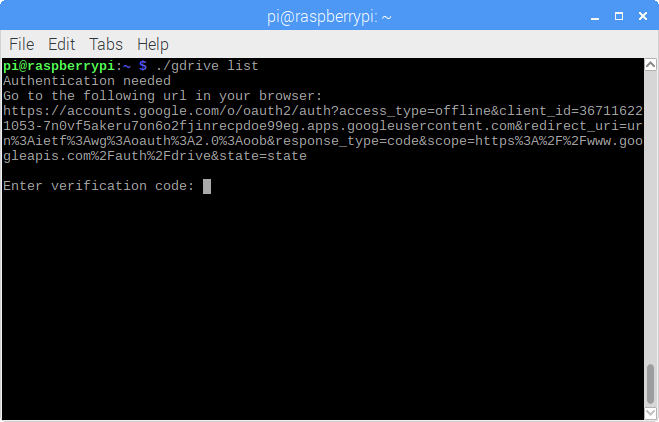 This how-to will assume you already have Raspbian installed on your Pi. If you a message that reads “python-pip is already the newest version,” that means that we’re good to go. However, that output doesn’t conform to the CSV syntax. Therefore, we’ll need to parse the data and make it conform. After you have the lines in place, you can save the file and exit the editor by pressing Ctrl+X, Y, and Enter. Alright, we’re ready to move on! If you’re wondering why we need a directory for a single file, it’s because we’re going to sync that directory to Google Drive. Once synced, everything inside the directory will correspond the contents of our similar Google Drive directory. …we will have a CSV file with broadband speed data in our new directory. Just follow the instructions: Go to the URL in your browser, sign in to your Google account, and allow “GDrive (…) to [v]iew and manage the files in your Google Drive.” Then you’re ready to enter the verification code. Finally, gdrive will list the contents of your Google Drive. The program returns the ID of our new directory. Copy that, since we’ll need it. Just replace ID with the ID your speedtest directory. We’re almost ready! All we have left to do is to make everything work automatically. For this, we’ll use cron, which makes it possible to schedule commands to run at specified times, like once an hour. Then save and exit with Ctrl+X, Y, and Enter. 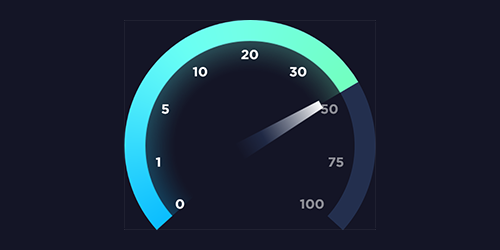 Now our broadband speed monitor is ready. It will log the results of the speed test once an hour at the top of the hour. 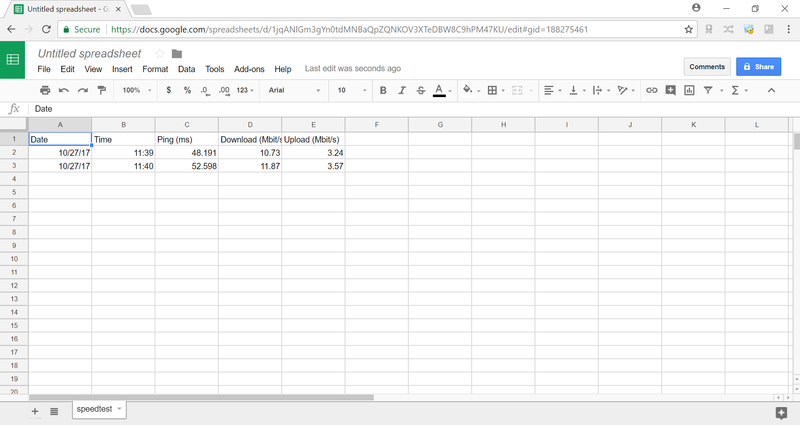 You can open the CSV file that’s in your Google Drive using Microsoft Excel or Google Sheets. If you prefer the latter, you’ll have to import the file (File > Import…). 11 Comments on "How to use your Raspberry Pi to monitor broadband speed"
The script itself is great, but the cronjob doesn’t work here. The second test of the python speedtest.py is wrong. Any tips, why the cronjob doesn’t work? I didn’t test it but I think the “shebang” is missing in the speedtest-cron.sh. Cron nominally outputs errors to a user’s mail. Since the pi doesn’t have mail installed by default I installed postfix and checked my mail after the next time the cron was supposed to kick off. From there I was able to see the ‘not found’ error. The pointer is pointing to the e in time. I follow the instructions exactly, but I have two problems. 1) RSP does not create Google tables (Excel), but the ordinary document (Word) writes the data into a line separated by a comma. 2) The speedtest task itself will not run… And so the document only contains the first entry. Please help me to resolve this issue, or advise what to do. Thank you. Thank you so much for the post! Got one quick question: Would you happen to know why the data will be uploaded to a Google doc and not a Google sheet? Great tutorial, much appreciated. Works as described. Am now monitoring difference between LAN and WLAN (2 RPIs) to search for dips in my connection at congested hours (evenings). Changed the minutes to */15 * * * * to monitor every 15 minutes. Will not leave it running for a long time due to bandwidth consumption. Changed the other crontab to 2,17,32,47 * * * * to avoid two speedtests running at the same time. Is it possible to sync with Dropbox instead of Google Drive? 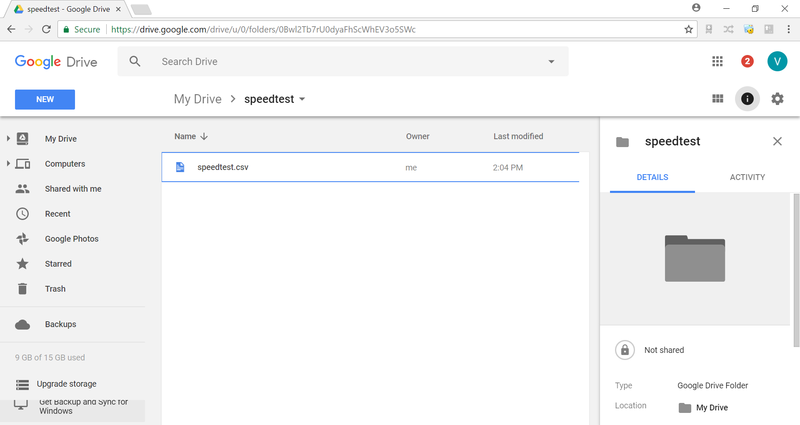 I can see my speedtest dir on Google Drive, but when I run ./gdrive sync upload speedtest MY ID. I get the following error: Failed to find root dir: googleapi: Error 404: File not found: MY ID., notFound, can you please assist.